p63 is a homolog of the tumor suppressor p53. It is identified in basal cells in the epithelial layers of a variety of tissues, including epidermis, cervix, urothelium, breast and prostate. p63 was detected in nuclei of the basal epithelium in normal prostate glands; however, it was not expressed in malignant tumors of the prostate. As a result, p63 has been reported as a useful marker for differentiating benign from malignant lesions in the prostate, particularly when used in combination with markers of high molecular weight cytokeratins and the prostate-specific marker AMACR (P504S). p63 has also been shown to be a sensitive marker for lung squamous cell carcinomas (SqCC), with a sensitivity of ~90%. Specificity for lung SqCC, vs. lung adenocarcinoma (LADC), is approximately 80%. 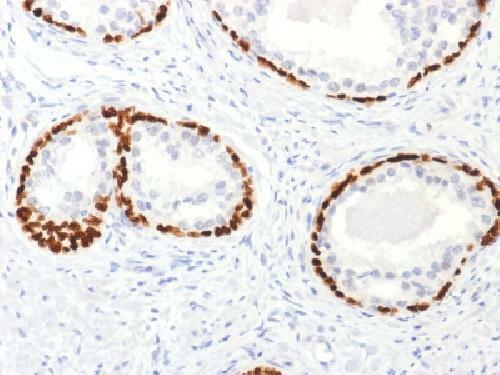 In breast tissue, p63 has been identified in myoepithelial cells of normal ducts. 200ug/ml of Ab purified by Protein A Column. Prepared in 10mM PBS with 0.05% BSA & 0.05% azide. Also available WITHOUT BSA & azide at 1.0mg/ml. Small volumes of anti-TP63 antibody vial(s) may occasionally become entrapped in the seal of the product vial during shipment and storage. If necessary, briefly centrifuge the vial on a tabletop centrifuge to dislodge any liquid in the container`s cap. Certain products may require to ship with dry ice and additional dry ice fee may apply. Formalin-fixed, paraffin-embedded human Prostate Cancer stained with p63 Rabbit Polyclonal Antibody. NCBI/Uniprot data below describe general gene information for TP63. It may not necessarily be applicable to this product. Signoretti S, et al. p63 is a prostate basal cell marker and is required for prostate development. Am J Pathol. 2000; 157(6):1769-75. Terry J, et al. Optimal immunohistochemical markers for distinguishing lung adenocarcinomas from squamous cell carcinomas in small tumor samples. Am J Surg Pathol. 2010; 34(12):1805-11.